Summary: A nice addition to the blackberry 10 family but it lacks the usual blackberry magic regards design and sheer quality, which is a real shame as I think it could have been superb. Plus the price sim free is ridiculous for the quality of the phone. Best of: The LCD display, battery life better than most, dual-core processor makes it very snappy. Worst of: Camera, the keyboard just isn’t as good as it should be when paying all this money, build quality shoddy with certain aspects, non removable battery. On the top of the device is where you will find the 3.5mm headphone jack, little hole for noise cancelling during phone calls and the power/wake-sleep button. On the left side is where you will find the Micro USB port for synching and charging the device and beneath this you will find the protected SIM and Micro SD ports. The right side of the device is where you will find the up/down volume controls with a push button in between for use when listening to music to play/pause and skip tracks. On the bottom is where the loudspeaker is placed, just like on the iPhone 5, 5C and 5S. There is also a small hole for the microphone next to the speaker. The back is where you will find the camera along with LED flash, beneath these is the customary BlackBerry Logo in silver. Lastly on the front of the device from the top is: Earpiece, sensors and front facing camera. Beneath these is the 3.1 inch display, BlackBerry logo and lastly the 4 row QWERTY keyboard. 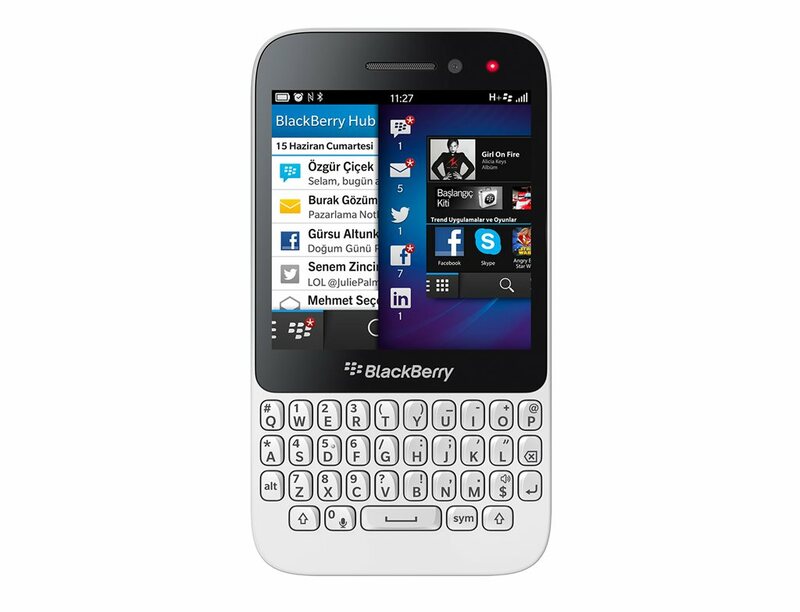 The eagle eyed among you will notice that I reviewed the BlackBerry Q10 not so long ago and I was very impressed with both the hardware and the software because it was such a premium device. So I was thrilled to receive the BlackBerry Q5 for review as it has allowed me to directly compare the two devices and I can tell you in no uncertain terms that the Q10 is a much better phone for your money, I will explain why in a while but trust me you would be better off spending the extra to get an awesome device than saving your money and being disappointed. Let’s begin with the hardware, the hardware on the Q5 is simply OK, it has a distinct lack of wow to it. Overall the device is slightly smaller and lighter than the Q10, which you would have thought would be a good thing? Well to tell you the truth it just doesn’t quite feel right in the hand for some reason, it’s too narrow and doesn’t have much substance to it. The actual build quality is mostly very good apart from a couple of niggling things, first of all the SIM/SD port cover is very loose and distracting when typing, which brings me nicely onto my second issue…the keyboard is simply not up to the standard I expected from BlackBerry, it feels very cheap to use and the click one very button is simply too loud for my liking, also its not as comfortable to use as the awesome keyboard on the Q10 which is soft and the key presses don’t feel like you are popping plastic packaging materials. The software side of things is absolutely identical to that on the Q10 and everything works very well as it does on the Q10. So what I thought I would do for you, instead of me rambling on about BlackBerry 10 again is to simply show you some of the screenshots of the platform on this particular device and then that will then allow you to make your own mind up about the device from an interface point of view. There is one slightly annoying thing that BlackBerry have decided to change with the Q5, they’ve changed the background theme from dark to light and it makes everything look and feel very different, the black theme on the Q10 looked really great but the white theme is something that I am really not a fan of so it is such an odd choice for me. Here’s where I will actually talk about part of the software now, as web browsing on a smartphone is sometimes essential for a lot of people, I know that it certainly is for me and without being able to browse quickly on my smartphone I don’t think I would be a very happy bunny at all. So how did the Q5 perform during our review? Very well in answer to that question, it has the same browser as the Q10 which is a very good thing as it means it is superb to use, web pages load up very quickly on both Wi-Fi and 3G connections (4G not available in my area at present) and more often than not it did as I asked of it without any problems whatsoever. For example I wanted to download a price list for a restaurant and within literally seconds I had the list go from the browser into Adobe Reader which is impressive. Text is very easy to read although due to the screen size you do have to zoom in a little to see the text clearly but that’s not an issue at all really, there is also a neat Reader Mode that allows users to simply press a button and it removes everything apart from the article you are wanting to read, it then allows you to change the size of the font to suit your needs. It isn’t a feature that I used or use very often but when I did try it during testing I did find it useful when my eyes were tired for example. Overall the answer to the main question…’Is it any good?’ is a categorical yes from me. As you can imagine with the BlackBerry Q5 media isn’t its main focus or selling point so for that reason my expectations weren’t as high as other devices on the market currently. My expectations were met with aplomb really as this device doesn’t excite the eardrums or wow the eyeballs with eye popping visuals when watching videos or listening to music, but it by far isn’t the worst smartphone for media as BlackBerry 10 OS does have a nice music player with decent sound (with a decent set of headphones as the ones provided are nothing short of useless). It’s the video playback where a device like this and the Q10 make you ask the question ‘what’s the point then?’ the reason for this is that although the screens on the two devices are quite good it is in fact the screen size that really lets the side down. As it is nowhere near a HD display on the Q5 YouTube videos play in HQ and widescreen meaning that every video is very difficult to watch clearly, this could well be because there isn’t an application specific to YouTube (you have to watch using the browser) but its possibly more down to the screen size, so as you can imagine I really didn’t bother watching any video content during testing apart from the odd one or two here and there because the experience is far from enjoyable. As for music playback I did this quite a bit to just gain some perspective and to compare the player and sound quality to its competitors, it’s never going to beat the iPods for sound quality but its a match for any mid range smartphone easily. The app itself is easy to use which is always helpful and you’ve got the added benefit of being able to skip tracks from both the lock screen and even without unlocking the device with the volume/media buttons on the right side of the phone. You will notice in the last screenshot the ‘Play on’ option? Well this option allows you to play your music externally on a compatible wireless device, now unfortunately my wireless dock wasn’t compatible (sad face) but this feature is something similar to other platforms (AirPlay, Allshare etc). Like I mentioned earlier on, the music listening experience is by no means the greatest ever but it isn’t the worst at also for that reason it’s a thumbs up as this is after all a mid range device for the younger people of the world. The camera section is much the same as media really, my expectations of the 5 megapixel camera weren’t high so anything positive was a bonus for me really. The issue though is the fact that it simply isn’t very good at all, it’s good for people who literally only want to point a click their favourite moments or events you simply don’t want to miss, but for anything more it’s not so good. The camera app is the same one found on the Q10, simple to use and quite basic too but in this case that isn’t a bad thing at all, in fact it’s probably the best thing about the camera overall. The video camera has the same 720p and Full HD 1080p options to choose from as the Q10 with the difference being, the Q5 underperforms dramatically and for that reason I haven’t supplied a HD video for you to see as I simply was not impressed at all. Particularly because the image quality was really grainy which meant that the event I was capturing was blurred to the point that I was unable to make out what I was taking the video of in the end, this is not acceptable even from a mid range device in this day and age I’m afraid. This brings me to where all of your photos are stored when taken, there are two areas in which to find and look at your images and they are: The pictures app and File manager. Both of which do basically the same job but one is more colourful than the other, the file manager does allow users to locate every type of file from the device though such as word documents and downloaded PDF files etc. As BlackBerry is so good at the communication side of smartphones with their amazingly successful BBM messaging service and superb Hub in BlackBerry 10 you would imagine that the Q5 would be able to handle your social needs without issue? Well lucky for you it does handle the apps very well, plus regarding the Twitter app it integrates right into the Hub for private messages which is very handy for quick replies to your friends. I only use Facebook and Twitter myself so I didn’t use LinkedIn or Foursquare but hopefully my experience with the Facebook and Twitter apps will give you some indication into how the other two apps would work on the phone. Firstly to Facebook and there isn’t really much to say about this app as it is exactly the same as on the Q10 and that worked very nicely and was just as simple and easy to use as on any other platform with the only annoying thing being that it doesn’t have an ‘Active Frame’ feature which would improve the user’s experience tenfold in my opinion. But aside from that issue I found that the app performed as well as it should, status updates were instant and messages to friends also instant so nothing more to complain about here. Lastly but not least is Twitter, again to be honest for those of you who have seen the latest version of the Twitter app on iOS, Android or Windows Phone 8 you will literally have seen this app before with the only difference being the BlackBerry Hub integration which I am sure a lot of people won’t mind not having on other platforms so really if you look just at the app interface itself it is basically the same just on a smaller screen. The one issue I did have with the app on the Q10 was that the timeline skipped up and down in time but I’m glad to notify you that this has been fixed and I had no such issue while using the app on the Q5 which was great! If you like Twitter and use it every day like a lot of people do then this app will suit your needs just like any other version on any other platform, which I would say was a compliment to the BlackBerry 10 platform as much as it is to the app itself as it means that in terms of usability it is up there with the best of them. BlackBerry smartphones of the past used to have the best battery life of all smartphones on the market but since BlackBerry 10has come along it seems like it’s just like any Android smartphone, the Q5 manages just one day of battery life to one full charge and by one day I don’t mean 24 hours so here’s an example of my typical day with the Q5: Charge the device overnight to 100%, check Facebook and twitter 5-6 times a day, browse the web for roughly 1-2 hours and text message family/friends30 times, these activities are nothing more than moderate use and the 100% battery went from full to 20% before 8pm at night. This is literally a typical day for me anyway as I have a phone that guzzles battery but I expected more from a BlackBerry to be honest. As for performance I was very impressed with how the device performed the everyday tasks, among these tasks were playing things like Angry Birds and surprisingly it did this with no stutter or lag whatsoever which suggests that the processer and RAM combination used in the Q5 is very good indeed, so overall I have been very impressed with the performance, but then again it is a device designed for communication as opposed to powerhouse games and media playback like the Z10 or recently announced Z30. At the end of my time with the Q5 I wasn’t sad to see it go like I was with the Q10 which is such a shame as I had hoped the Q5 could be a phone I could live with day to day as its cheaper to buy but it still possesses the power and quality of the Q10 in a cheaper body, but it really did disappoint in key areas such as the keyboard performance and for that matter alone I wouldn’t buy one of these devices. But I can see this being a viable alternative for the younger generation who can’t afford the likes of the Samsung’s and HTC’s of the world but as a main device for powerhouse users it just doesn’t cut the mustard. A tech reviewer for 4 years, I have a great passion for mobile phones specifically but review a vast array of technology.